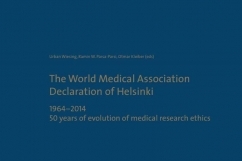 This celebratory publication includes feature articles by leading ethicists on the history, meaning and future of the Declaration of Helsinki and its implementation across the world. A summary of the 2013 revision process by the Chair of the WMA revision workgroup provides an insight into the complexities of this process. These articles are interspersed with personal comments by the most important international players active in the field of medical ethics, who give their unique perspectives on the significance of the Declaration for their organisation and specific field of work. The publication also contains all previous versions of the Declaration of Helsinki reprinted in full, as well as forewords by high-level dignitaries.